Stardate 4946: The Andorians have developed a cure for the Canopus plague, which has broken out on the Lexington. But the Lexington was unable to contact the Andorian authorities. Captain Garrovick of the U.S.S. Exeter beams down with Security Chief Cutty, the Andorian officer B'fuselek and two security officers to investigate what is going on on the planet. When they arrive in an underground government building, they are apprehended by a renegade Andorian named Kinthmus and his Tri'Leth Brotherhood, who have allied themselves with the Klingons and disabled all subspace communication with the outside world. One of Garrovick's men is killed. When Garrovick and Cutty escape, they have to leave behind B'fuselek and the other crewman. B'fuselek pretends to have sympathies with Kinthmus' cause, but then escapes with the fellow officer. Meanwhile on the surface, Garrovick has overwhelmed the Klingon Chang. The urgently needed medicine is delivered to the Lexington. Unlike some other fan series premieres that I have seen, the first adventure of the U.S.S. Exeter does not come with a cookie-cutter plot. Its story is quite intelligent and may have given us a TOS episode well above average, had it been an adventure of the Enterprise. It also expands our knowledge about a species from TOS that has become a fan fiction favorite, the Andorians (although what we see is not in line with what would later be established about them in Star Trek Enterprise's fourth season). Unlike a few other and perhaps better fan productions, however, "The Savage Empire" doesn't even try to develop the regular characters. We learn next to nothing about them except for a few little bits about B'fuselek, while there is a rather long-winded exposition giving us details on the planet Andoria. But this doesn't have to be a bad thing, especially since the acting shows room for improvement. It may be better to save the big character conflicts for future episodes. I don't like how the actors try to speak in several funny dialects, as if this would give their alien characters distinctiveness. It sounds just too artificial. The attempt at humor with B'fuselek not understanding Garrovick's metaphors (the Andorian underground building as an "ant hill"; the suspicion that B'fuselek may be "covering his bets" talking to Kinthmus) is not successful either. The episode overall has a good balance between action scenes and dialogues. Something that astonishes me is the well staged fight of Garrovick and the Klingon Chang. It reminds me of Captain Kirk's best days. All of the various other action sequences of the episode pale in comparison to this one. Many of them they look very clumsy, as if the actors were unwilling to move and the camera were unwilling to capture them. The production design of this episode suffers from essentially the same shortcomings as in many other fan productions. At this point, Exeter has only a partial build of the ship's bridge; this is no problem as there are only some brief scenes on the bridge anyway, and I don't miss a possible more extensive coverage. The ship corridor built for the series looks just right. However, the gray of the walls appears as bright white. And it is not the only part of the episode that is overexposed. Only the exterior shots are well illuminated. I like the underground habitat, and the props all have the right look as well. The costumes are not so great, especially the uniforms of the Exeter crew could fit better, and the department colors are not quite right either (the plain blue should be a tad more like teal, and the plain yellow should be more like mustard). Well, and what can I say about the purple dinosaur that attacks the crew on the surface of Andoria? I hope this was meant to be an in-joke of some sorts, because the "special effect" really looks like what it is: someone holding an incredibly cheap plastic figure into the camera. Other than that, I have no complaints, as the people who outfitted the series overall did a great job. I don't think the score of the episode consists of more than all kinds of bits that we know from TOS. This clearly contributes a lot to giving the episode the right feel, in addition to the usage of sets and props that are just as we would have expected them in TOS. The music could have been better arranged and timed though, and overall toned down. By today's standards the transition between two scenes with the typical TOS "fanfare" sounds is too often very harsh, as if the music was meant to tell the viewer "Wake up!!!" I noticed that in other fan films too (and, of course, in TOS itself), but I think it was overdone here. Remarkable facts: The star system of the Andorians is Epsilon Indi. The Andorian emblem is accordingly the one of Epsilon Indi from the Star Fleet Technical Manual. -- Andorians live in underground habitats in order not to disturb the delicate balance of nature. -- The Klingons have acquired a cloaking device, and the character of Chang is apparently meant to be the same General Chang who would command the BoP that can fire while cloaked in "Star Trek VI". -- The Klingons have also provided a subspace manipulator to cut off Andoria from intergalactic communication. Stardate not given: An Exeter landing party finds that the planet-based Starbase 16 has been completely destroyed, and that the saucer of the U.S.S. Kongo has crashed on the planet. The Exeter discovers the Kongo's stardrive adrift in space, but no one is still alive. A strange device of alien origin on the Kongo emits gravitational waves. Before it can be salvaged, Tressaurian starships attack the Exeter. Captain Garrovick can fend off the attack and take a prisoner. The device, however, is a transdimensional shifter and is not of Tressaurian origin, as science officer Harris finds out. When more Tressaurian cruisers attack the Exeter, the Tholians appear on the scene. They destroy the Tressaurian ships and demand that the Exeter leave immediately. The Exeter crew tracks the flight paths of the Tholian ships to a red giant, where the Tholians have built a much larger version of the prototype, capable of shifting a whole region of space, inhabited by Tressaurians, into another universe. Despite his hatred for the Tressaurians, Garrovick decides to help them and destroy the Tholian machine. After creating a diversion, the Exeter approaches the site where Garrovick plans to activate the prototype and beam it into the vicinity of the big machine, thereby destroying it. During the fight with Tholian vessels, the Tressaurian prisoner breaks free. When the transporter chief doesn't respond, Vandi Richards takes over the task. She runs into the Tressaurian and eventually manages to beam him into space, together with the prototype which destroys the Tholian weapon as planned. But Richards, like some other crew members, is killed by the resulting gravitational wave. Wow. Wow! I would have expected the staff of Starship Exeter to work hard on their second installment, but the result of their efforts blows me away. It has taken some nine years to produce this episode, but it was worth the wait. "The Tressaurian Intersection" is much better than the first episode on all accounts. It is among the most exciting fan films I have seen. Perhaps most obviously the CGI effects have been greatly improved. The zoom-in on the bridge as in "The Cage" is a highlight, as well as the destroyed surface of Corinth IV , the crashed saucer of the Kongo, its floating stardrive section, the Tressaurian and the Tholian ships. 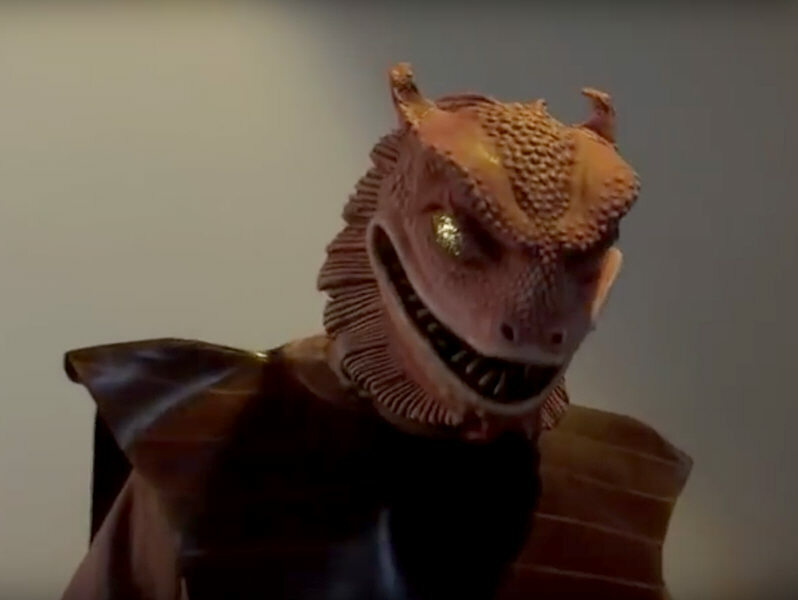 Almost everything is top-notch, among the very best effects in fan films. Only the light effects fall a bit short of the otherwise great visuals of the episode. While I understand they are supposed to be as close as possible to those of TOS (closer than in other fan films set in the era), the light spots especially in the final chapter are simply too numerous and too colorful. The sets are awesome. We finally get to see the whole bridge of the Exeter. But the set that impresses me most is the destroyed interior of the Kongo. I can't tell how much of this set is real and how much is CGI. Either way it looks incredibly realistic. I also like the alien dimensional shifting device very much. I only should have recognized earlier that it was Tholian, because the conical design gives us a cue. Well done! The costumes are more authentic too than in the last installment, but not yet all of them. Finally, the reptilian Tressaurians look frighteningly realistic. What an improvement over the silly purple plastic dinosaur in the last episode! Overall the production values are not quite as high as in the latest installments of other recent fan series though. Especially as the lighting and the camera work is concerned, Star Trek Continues has set a new standard and makes other fan efforts pale in comparison, just as with its more accomplished actors. But "The Tressaurian Intersection" makes up for these shortcomings with a truly exciting story and an overall convincing execution. One thing to annotate is that the episode has unusually strong racist remarks from Garrovick and from Cutty when they are talking with their Tressaurian prisoner and are talking to one another about the Tressaurians. Garrovick's past experiences with the Tressaurians and the recent attack on the Kongo sets the theme of open hatred. But it is shown in a quite appropriate fashion how Garrovick overcomes this sentiment and does what needs to be done against the Tholian threat, even if it helps his enemies. I am pleased with how the episode handles the controversy. Garrovick's history with Tressaurians and the reluctance to help them is also exactly the kind of character development that I missed in the first episode. Well, Garrovick's monologue, when he ponders about the right course of action in light of the Tholian threat, takes away much of the steam. It doesn't come at the right time. But while I didn't care for his talkative personal assistant Richards at the beginning, the scene in which she enters his room and reminds him of his duties works well. And it is followed by another highlight of the episode, as Garrovick develops the plan to attack the Tholian device on his monitor. Speaking of racism, it is also noteworthy how the doctor always refers to B'fuselek as "The Andorian". It is obvious that this is in the tradition of McCoy's quibbles with Spock (or Pulaski's with Data). B'fuselek indeed has many characteristics of Spock or Data, not only as the resident alien with unusual senses and capabilities, but also as someone whose socialization is not easy and who attempts to understand human behavior, often in vain. On the other hand, B'fuselek's funny language and his temper remind me a lot of Mr. Scott. I like B'fuselek better in this episode than in "The Savage Empire", where I am sorry to say he was much in the role of a useful idiot. I like almost everyone better in "The Tressaurian Intersection", which may have to do with improved acting and direction. The score of "The Tressaurian Section" is far more pleasant than the TOS medley in the first episode. The new score is always spot-on, it is original to some extent, and it includes "softer" passages where it suits the scene. Remarkable shuttle: We see the Archimedes NCC-1706/3. Remarkable facts: It was in his fourth year on the Academy that Garrovick and his fellow cadets were on a transport, heading for a survival training. The ship was attacked by the Tressaurians, he and several more cadets escaped with lifeboats and landed on Tangaro. Garrovick was the senior cadet and organized their survival. He was rescued after four years. In the meantime, his uncle, Captain Garrovick, had died on Tycho IV, as mentioned in TOS: "Obsession". -- B'fuselek, like all Andorians, is capable of sensing gravitational fields. -- The Tressaurians are said to be related to the Gorn. -- The Tholian transdimensional device generates gravitational waves strong enough to shift a region of space into another dimension or universe.